The important point to make is that these teapots were relatively cheap products at the time so they had chips, firing flaws and glaze faults from new. The glaze often has bubble marks, is not even, as the pot was ‘dipped’ into the liquid hence the glaze runs. If the teapots were used for making tea with boiling water the glaze soon crazed and on some pots there is a graduation of crazing from light at the lid to heavy nearer the base. The ‘drip’ at the end of the spout is very prone to being knocked off and some pots have restorations here. The other place easily damaged is the underside of the lid where there is the retaining lip.The lids often are a slightly different glaze colour or opaqueness from the base and the fit to the pot sometimes leaves a lot to be desired. Where lustre is applied it is not as hard as one would expect from a metal glaze. The lustre is described in different texts as silver, platinum, chrome. I am unsure of the exact composition so for ease I will refer to it as silver. 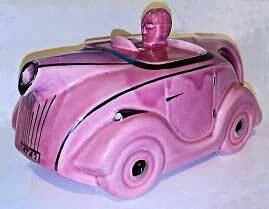 The lustre is easily polished away and many early pots have ‘bald’ spots on the mudguards and back of the driver’s head. Hence when collecting one would expect a few minor faults particularly on the pre-war pots. A perfect teapot is worth a premium above the suggested valuations. Is the car registration OKT42, OKT 42, or OK T42? Sadler’s in their 2000 revival document describe them as OKT42 teapots. The standard way of writing early car registrations is to have a gap between the letters and numbers. The registrations at the front of the car sometimes have a gap but the rear number is always given as OK / T42. In view of the confusion I will adopt the Sadler OKT42. 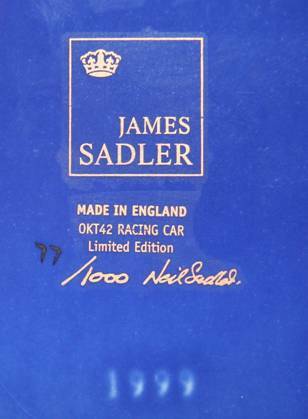 Details of the Sadler manufacturer’s marks found on OKT42s are given in List of Sadler marks. The internal strainer pattern is very important to the identification of the teapot. To be a genuine pre 1952 Sadler it must have a strainer! But many copies and forgeries also have strainers! There are three main patterns 4, 5 or 7 hole strainers. The usual or standard pattern is the 5 hole strainer as shown normally in the form of a cross. The 7 hole strainer is mainly seen with the mottled teapots and those with the Sadler banner back stamp. To my knowledge all Sadler teapots prior to 1952 have strainers. The Sadler revival teapots of 1999 do not have a strainer, neither do some of copies and re-use of moulds. 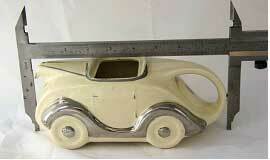 The body of the teapot was slip cast but the strainer was made from a flat piece of clay shaped into the cast. The holes were formed with what looks at times like a pencil being pushed into the soft clay and vary in diameter! The teapots were dipped into the glaze which led to runs, lack of evenness and to differential opaqueness. They were dipped without their lids so that the glaze coloured the inside of the teapot. Often the glaze colour of the lid is a different shade to the body of the teapot. 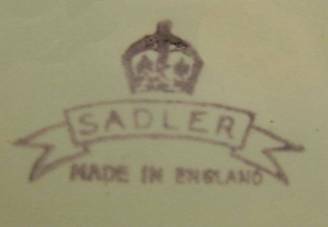 If the teapot does not have glaze inside the teapot it is not a genuine pre 1952 Sadler. Later pots post 2000 have been dipped and sprayed and some have glaze colour inside the teapot but the majority do not. Early Sadler Pink teapot showing glaze runs. At the end of each page there is a box giving measurements and valuations for the teapots for example! There are two measurements given – the overall length and the width. 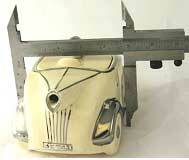 Measurements have been taken with callipers as shown and are from the front of the teapot to (in the case of the car) the rear bump of the tail light. The width of the pot is taken mid way along the lid opening. Since there is some taper this width is not particularly accurate, however the length and width give a good indication of the size of a particular teapot. The valuations are a personal opinion and are listed as points which at the current time one point is £1 sterling. The valuations are based on an average example of the pot with no chips or cracks and good lustre where applicable. The standard mark indented into the base of the teapot is the Registered Number mark as below. This was formed by an upstand on the mould. All Sadler teapots need to have this mark but this mark is much abused – see other teapot designs: later use and forgeries and racing teapots. There are slight variations of the mark which can often be seen in the relative positions of the ‘R’ of Registered and the ‘N’ of NO. 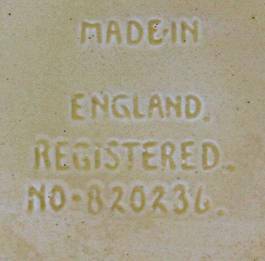 To my knowledge there are only three stamped marks on OKT42 Sadler ware (with one size variation). The pre 1999 ones are stamped in black on the underside before the final firing. 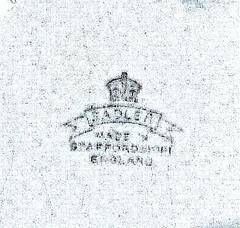 The earlier mark is a crown banner design seen on the early cold painted teaset (not on teapot) with MADE IN/ STAFFORDSHIRE/ ENGLAND (This is a standard period Sadler mark 2.8 mm across). The later version is similar but missing the word STAFFORDSHIRE and comes in two sizes. A small version 2.9 cm across the banner and 4.2 cm larger size. The smaller version is considerably scarcer. This banner mark is often seen on the mottled teapots and the later colourways and is generally assumed to have been introduced in 1947. The two Sadler revival teapots issued in 1999 have a gold James Sadler transfer on the underside to indicate that they are one of a limited edition. Also instead of the previously used indented Registered Number mark they have a small upstanding 1999 date mark.